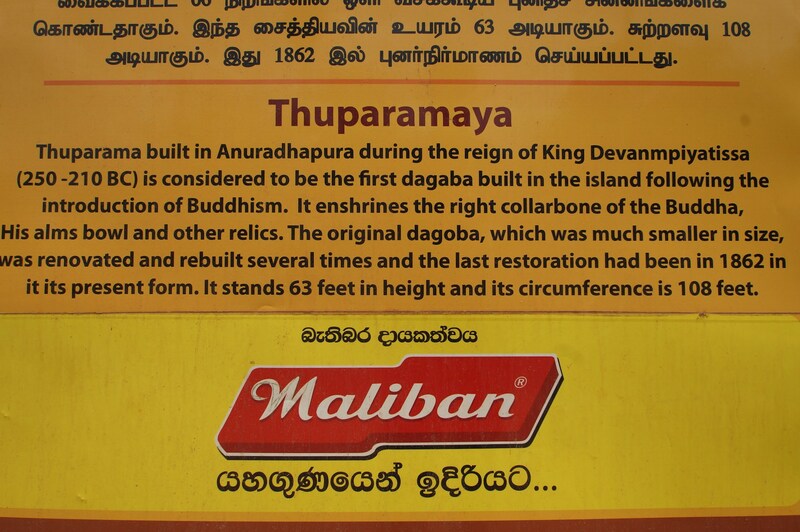 …the Great Sage proceeded to the site of Mahameghavanarama, which today we call Anuradhapura. 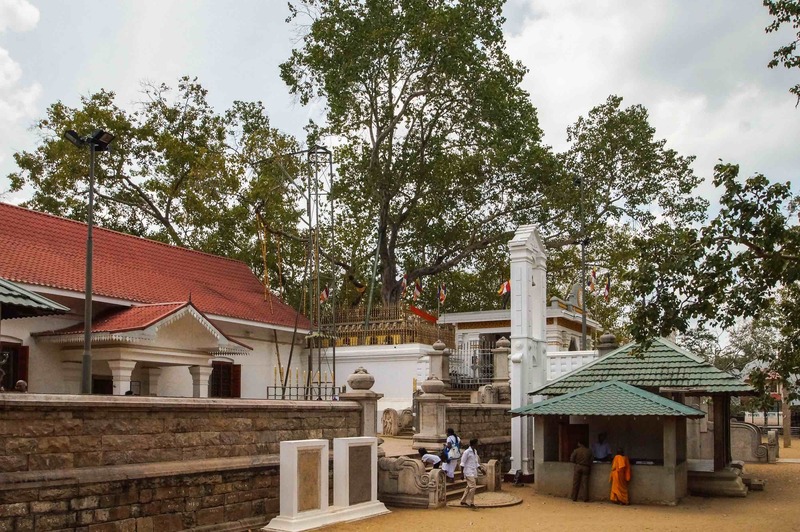 The Savior, along with his disciples entered into meditation, and thus consecrated the site where the sacred Bodhi Tree would be planted during the reign of Devanampiyatissa. 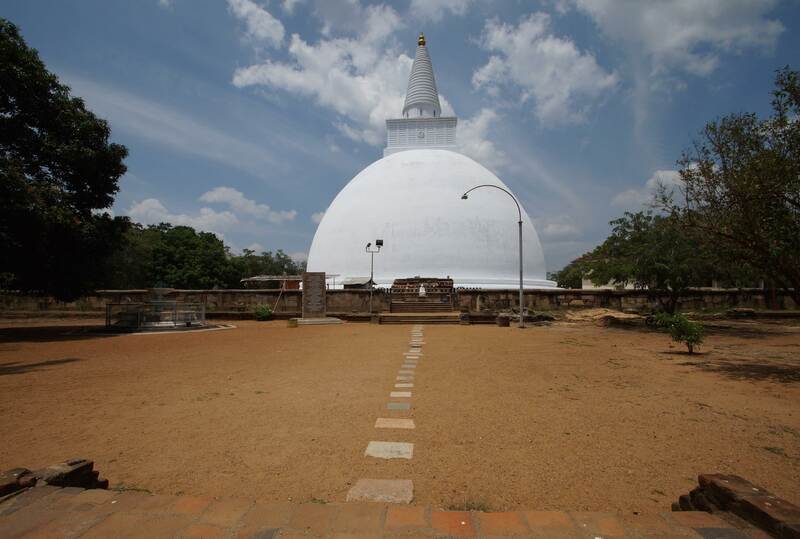 Likewise the place where the stupa of Thuparama in Anuradhapura would one day be built. 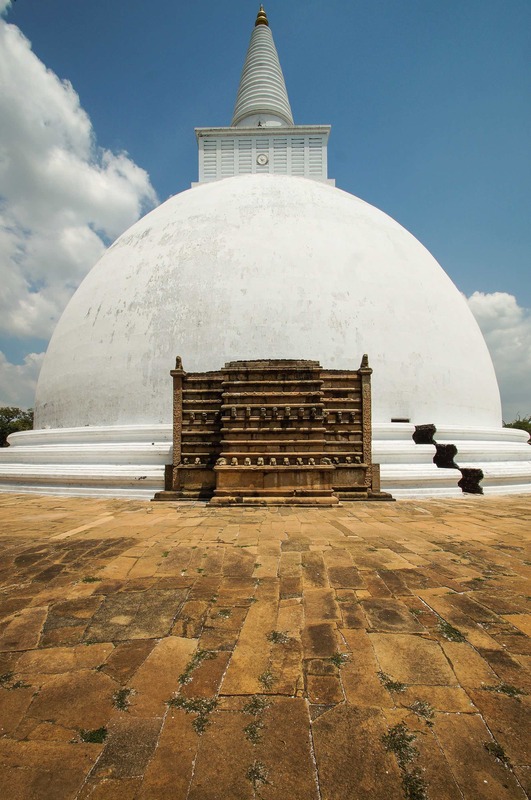 We were now in the part of ancient Anuradhapura called the Mahavihara. 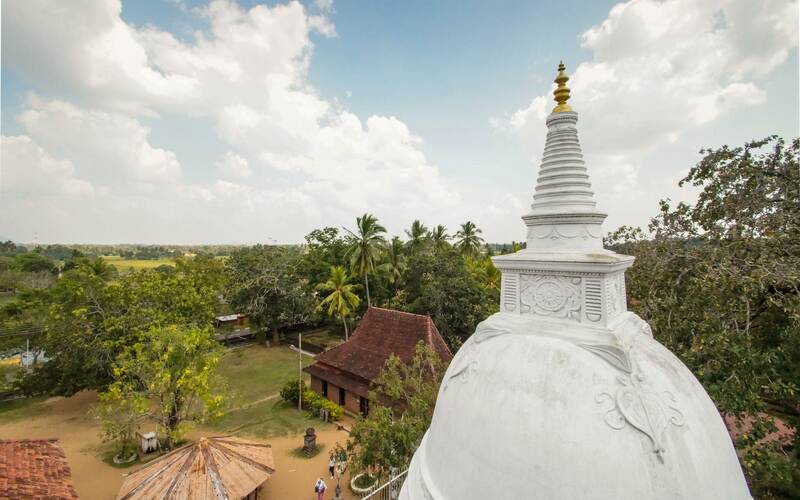 The “Great Monastery” was the first of the three monasteries which flourished in the city thanks to the patronage of the ruling dynasty; the monks of the Mahavihara also promoted the most conservative interpretation of Buddhist doctrine. 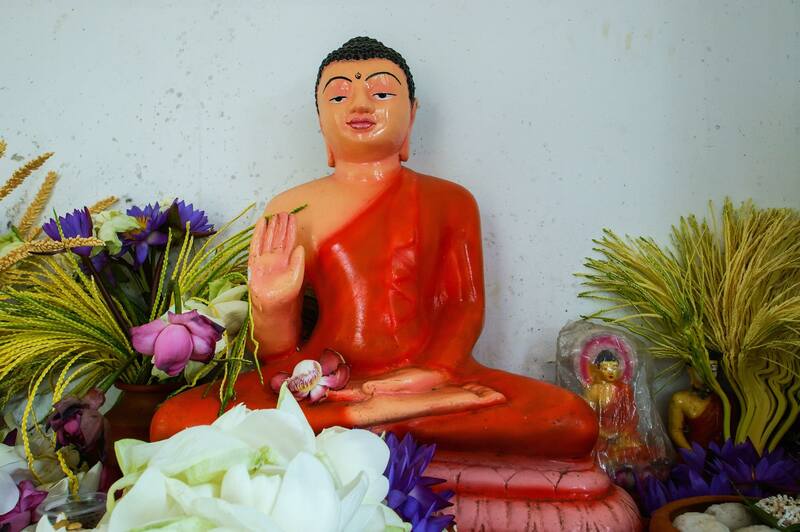 As in the Christian world, doctrinal rigidity would result in some leaving the Mahavihara and setting up a more liberal approach to the Dharma. 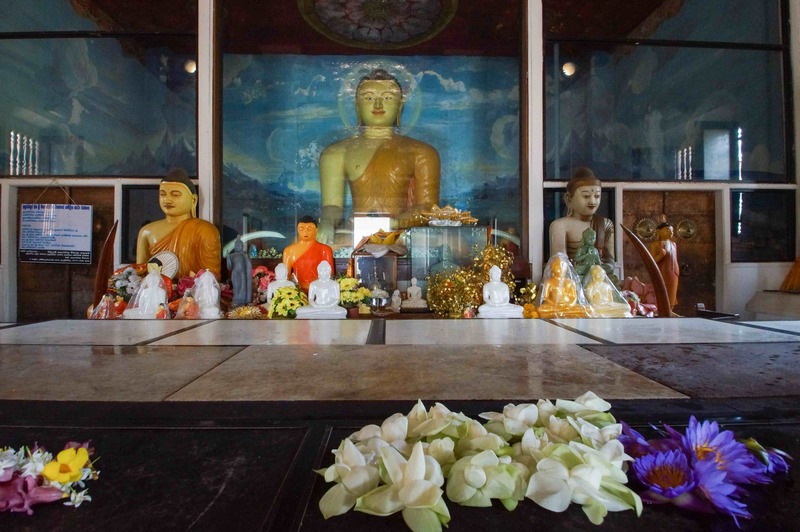 It was to the area just north of the city – at what would become Abhayagiri – that these dissident monks went to found a new monastery. 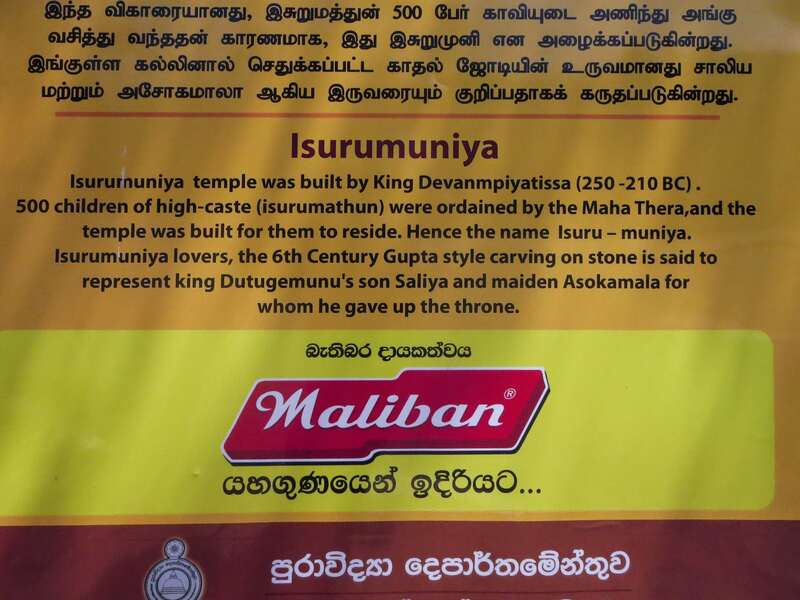 Just as interesting to ponder and appreciate as the physical ruins of Anuradhapura is the intellectual architecture of the various “takes” on Buddhism that were debated here. Visiting scholars would take in the discussion and export it to their homelands, from China and Japan to Thailand and Kashmir. 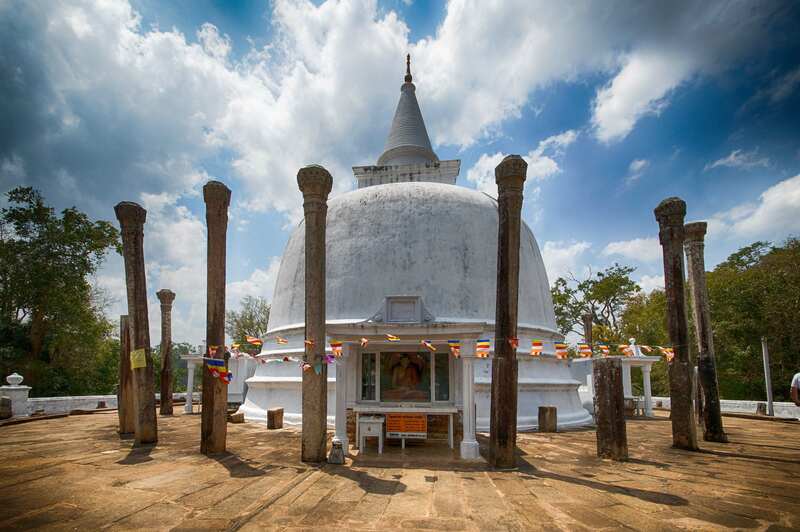 The vatadage is thought to be an architectural structure unique to Sri Lankan Buddhism and while the wooden roof has not survived, the pillars do give a clue as to how it would have worked. 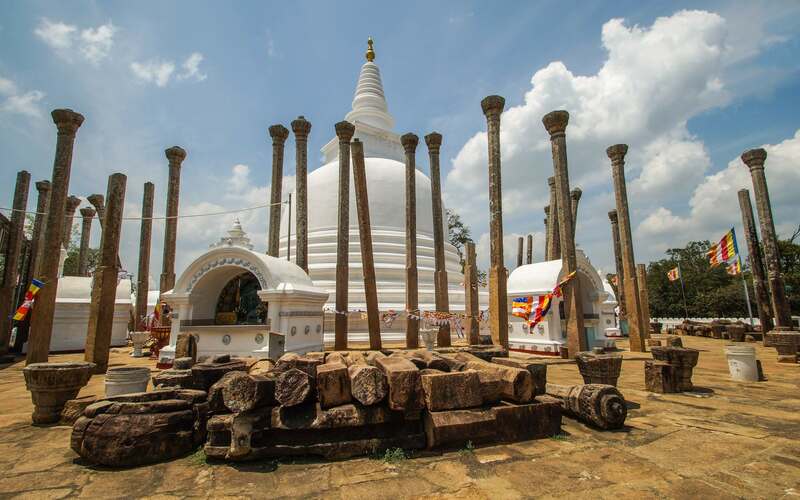 It seems likely that the pillars that we see standing were put back up by restoration crews in the past hundred years. 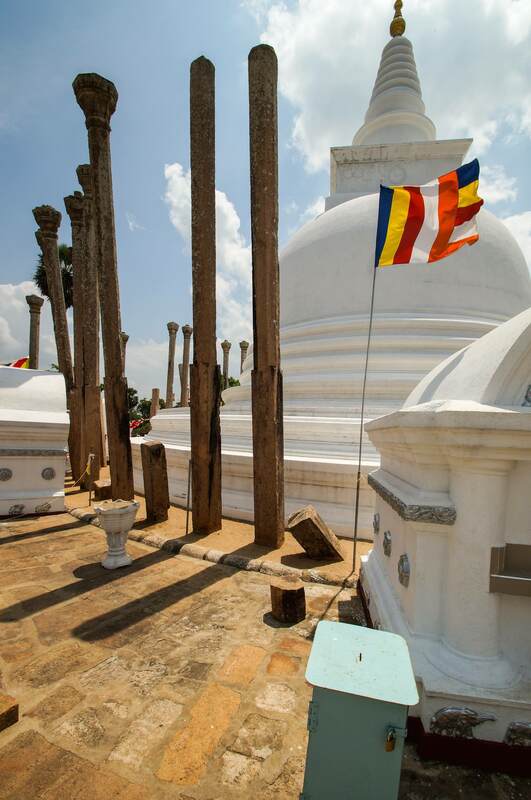 Fluttering all over the Anuradhapura site – and indeed all over Sri Lanka – are colourful flags characterized by six vertical bands. 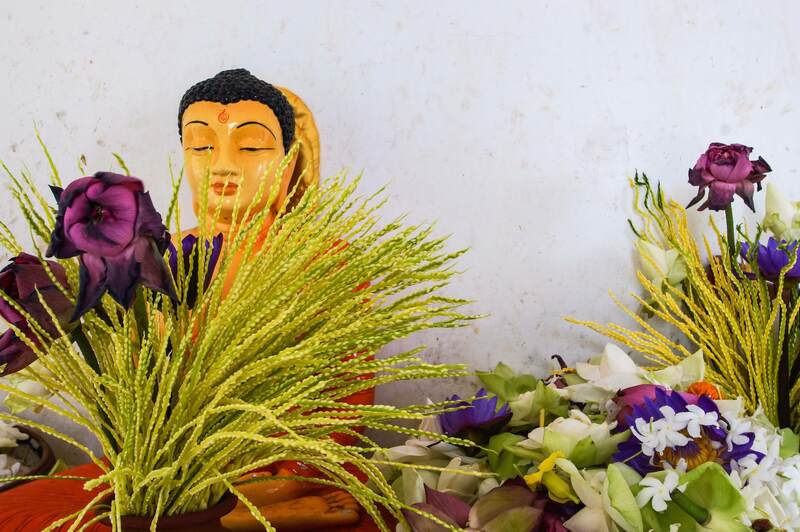 The five colours and the composite of all five colours symbolized in the sixth band are said to represent the six colours of Siddhartha Gautama’s aura which came from his body at the moment he attained Enlightenment and became the Buddha. 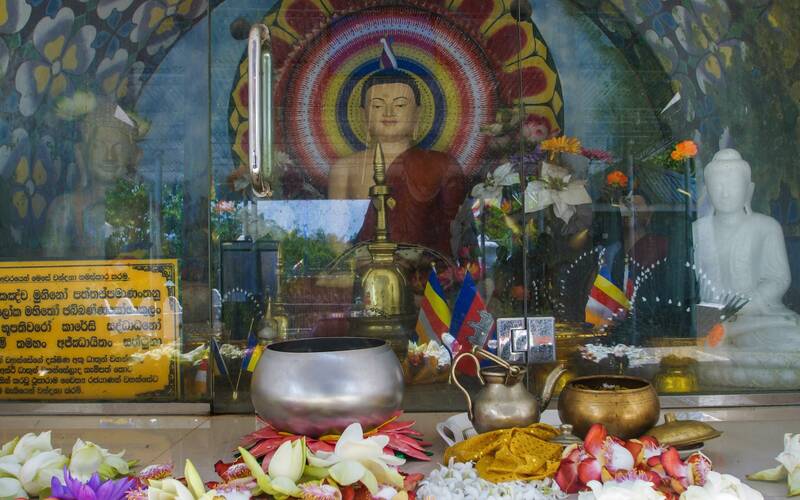 This Wikipedia article provides images of the flag as it is used in various other Buddhist countries. 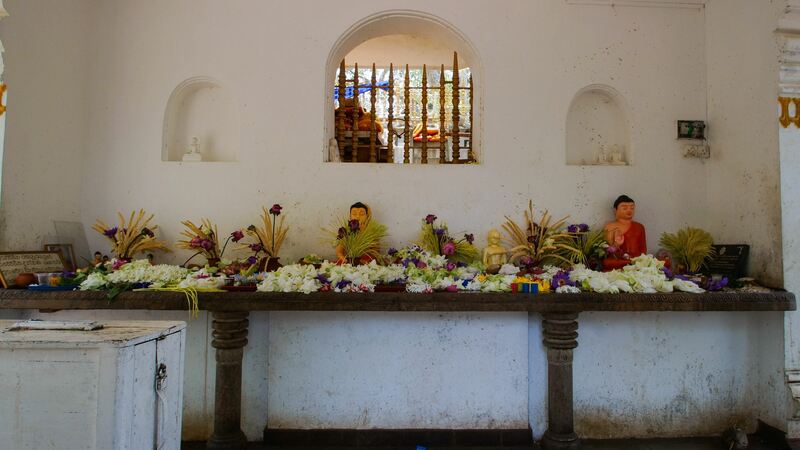 Sometime around 12:30 Mahinda pulled up to a roadside stand where we had a cool drink and a quick rice and curry. 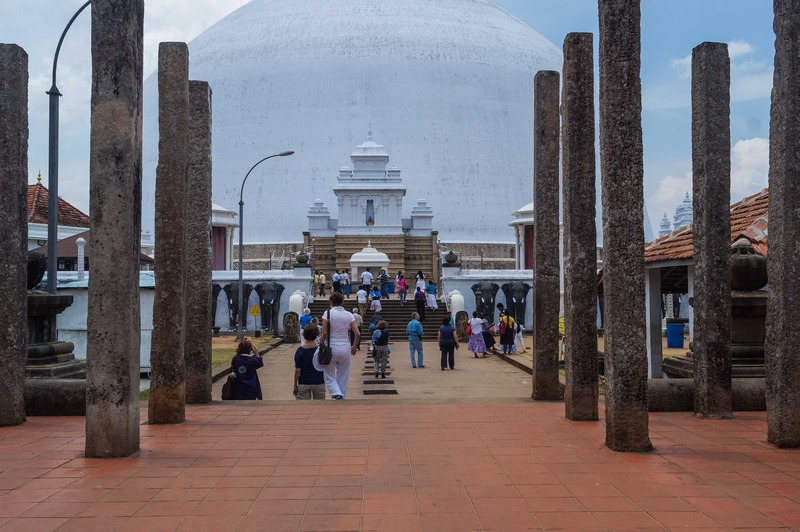 I was definitely starting to sag a bit thanks to the heat – but twenty minutes later we were on our way to the #1 attraction of the ancient city – the Sri Maha Bodhi or Sacred Bodhi Tree. 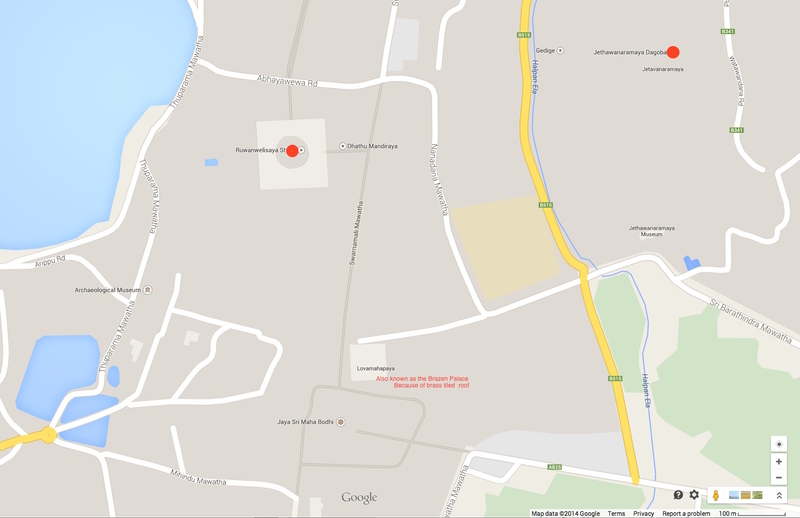 My approach to the Sri Maha Bodhi was from the walkway that runs down the middle of the map (see below). 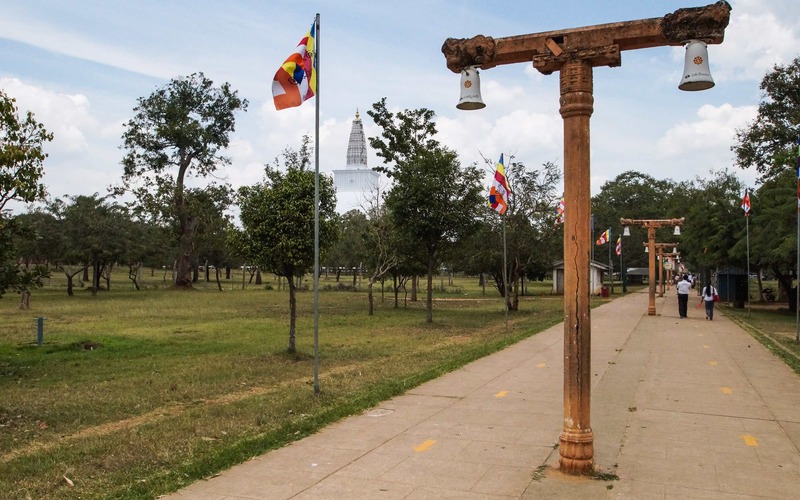 Leaving a visit to the stupa on my right for my return, I headed down the path. 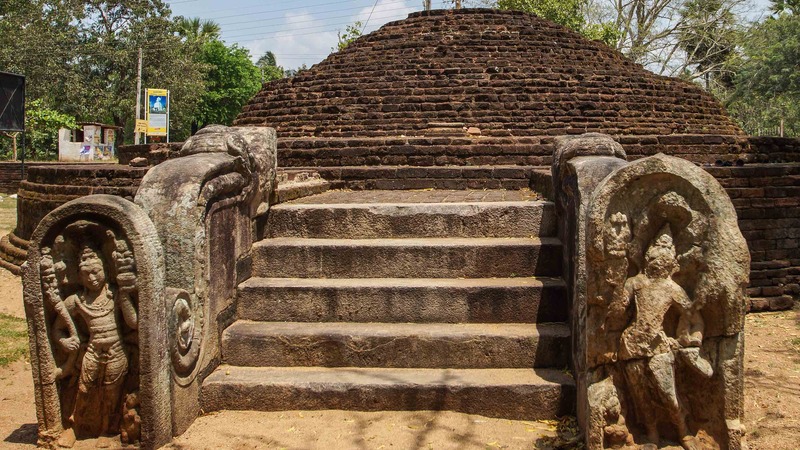 When you are almost at the entrance to the Sri Maha Bodhi, you pass by (on the right) the ruins of what was once supposedly a nine-storey monastic residence housing a thousand monks and attendants. 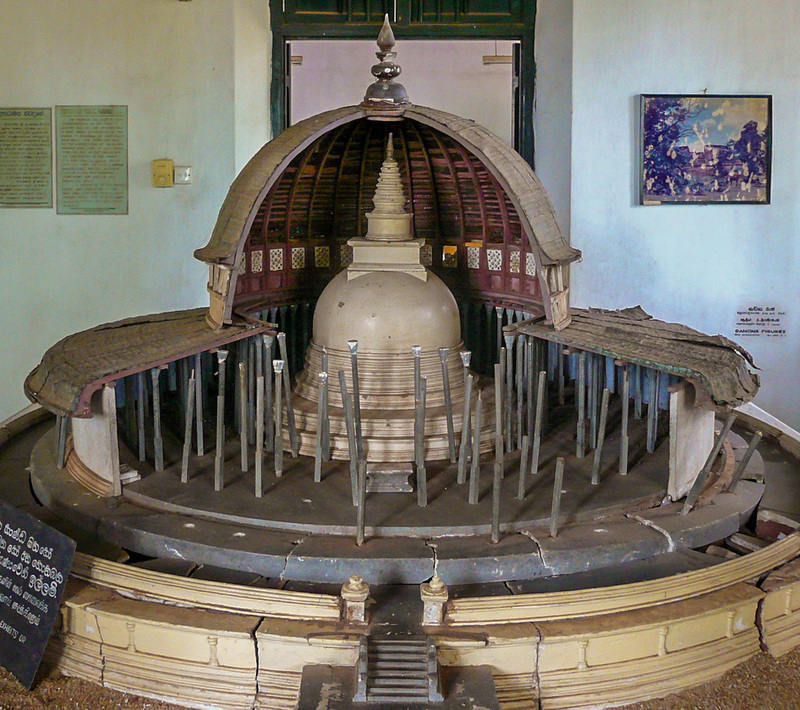 Given the bronze roof it used to have, it is called the Brazen Palace. 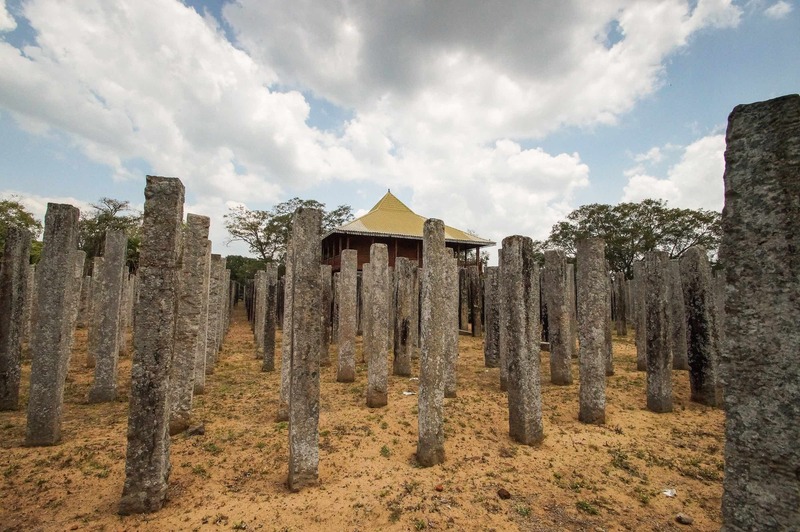 All you see now are pillars, lots and lots of pillars! 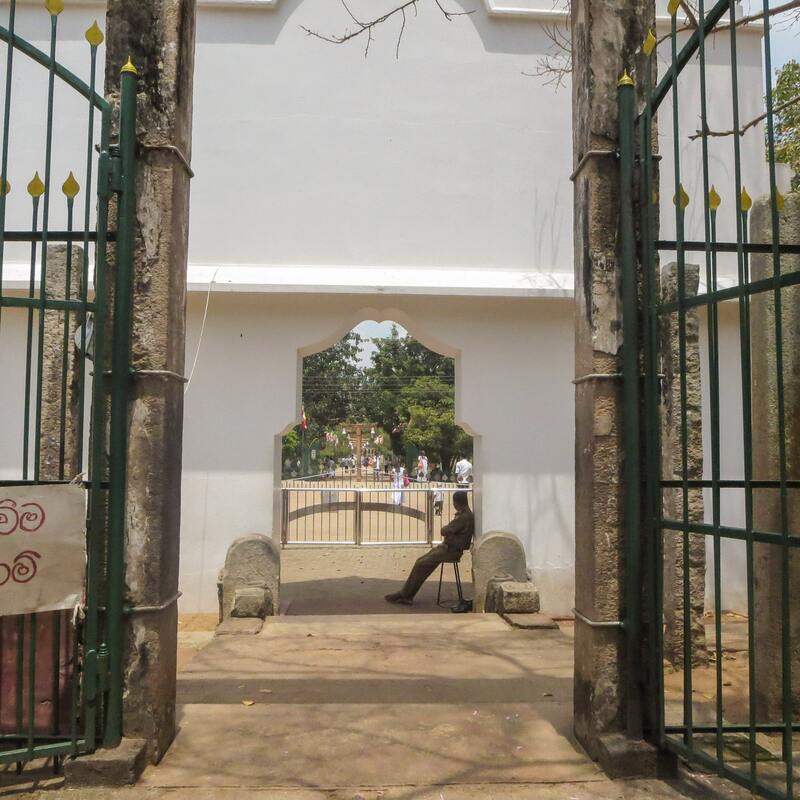 The walkway ends at a guardhouse/entry gate – some residual nervousness about Tamil Tiger bombers in evidence here? 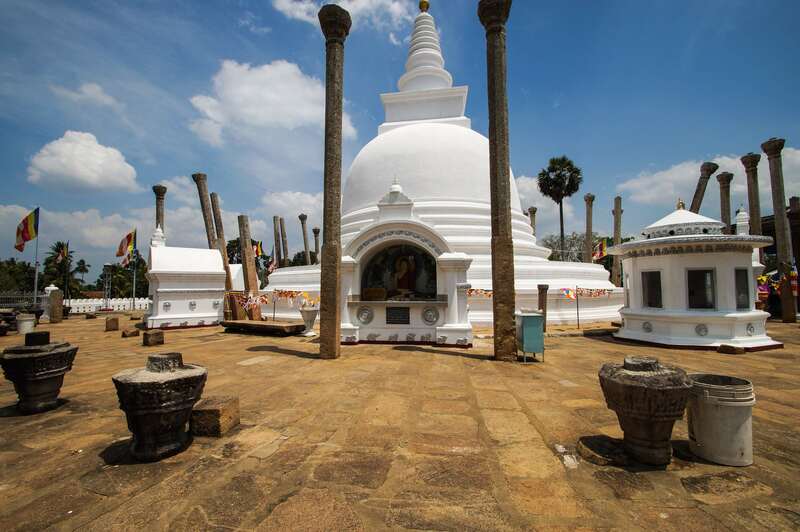 – and into the grounds of the Sri Maha Bodhi temple complex I went. 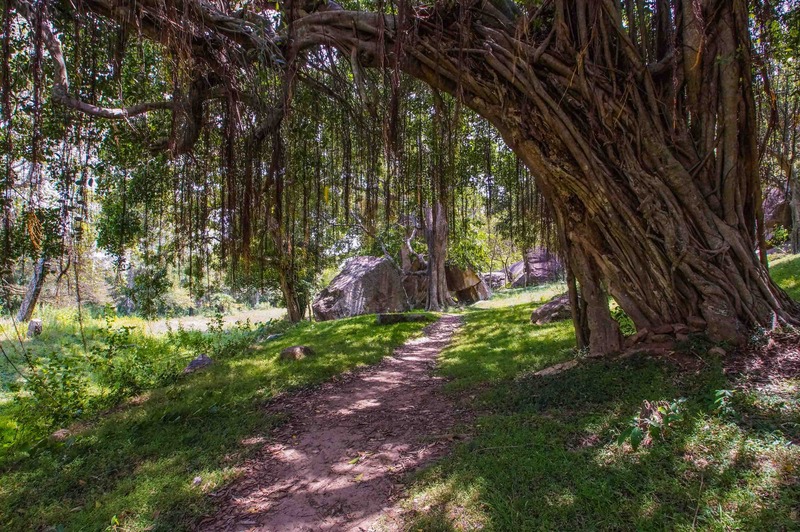 In seeing the actual Bodhi Tree – believed to have grown from a shoot taken from the very tree under which Siddhartha Gautama became the Buddha – it would undoubtedly help to be a devout Buddhist. Otherwise, it really is an underwhelming experience. As the pic two down show, the actual tree is inaccessible behind gates and walls. 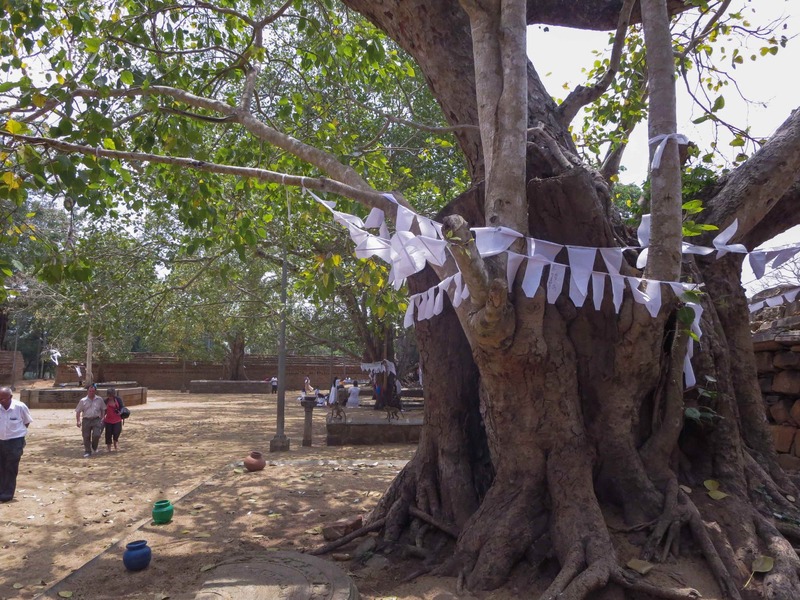 My experience in Bodh Gaya underneath the original – or not – Bodhi Tree was completely different, a most definitive feeling that I was somewhere significant. 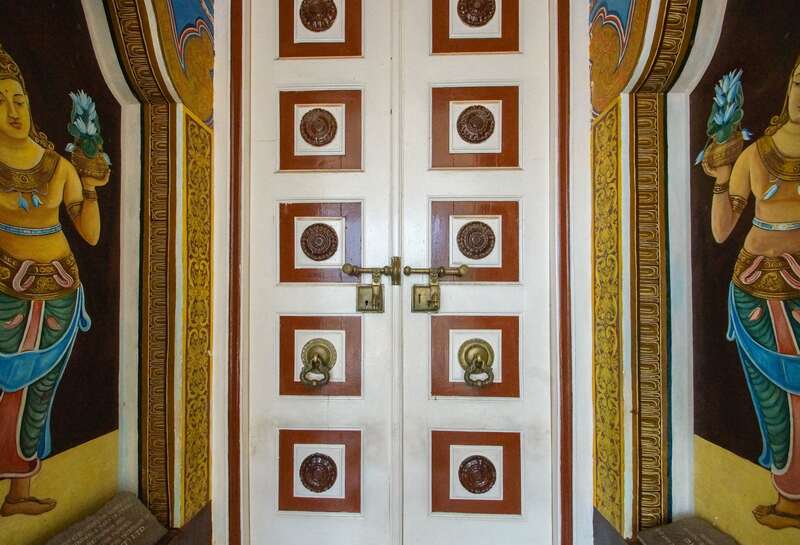 The fact that there were three hundred Tibetan Buddhist monks there that evening chanting their sutras may have had something to do with it. 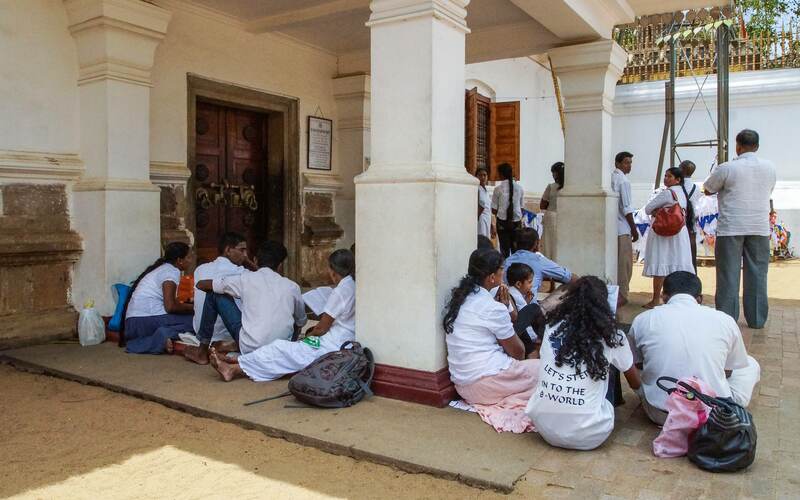 Still, in the context of Sri Lankan Buddhism, this is Ground Zero, the very centre of their Sinhalese Buddhist faith and should be taken as such. 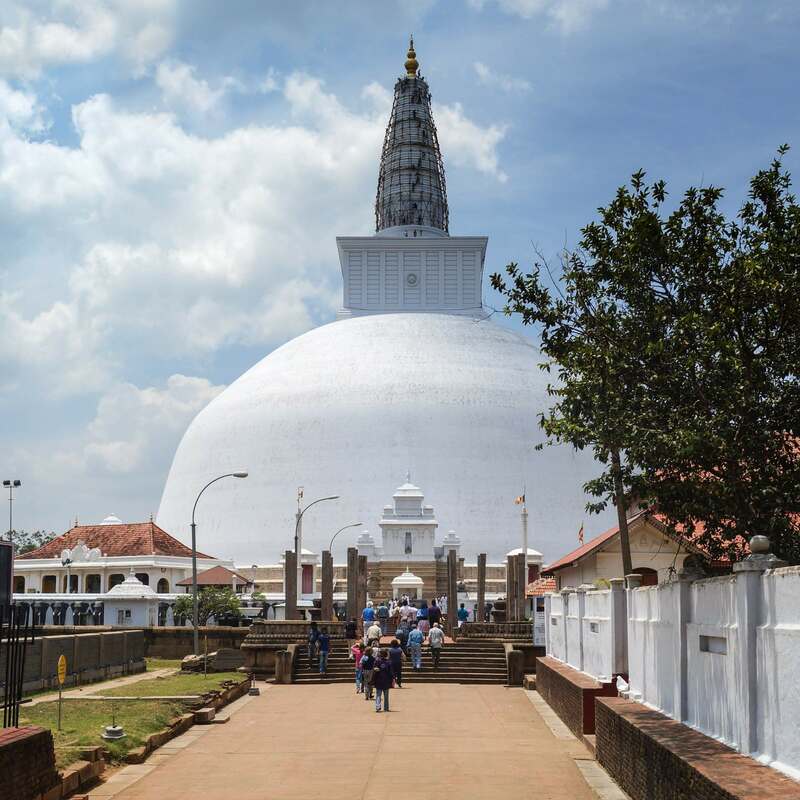 My visit to the Sri Maha Bodhi complex done, it was back down the walkway to the Ruvanvelisaya Dagoba that I had walked by on the way up. 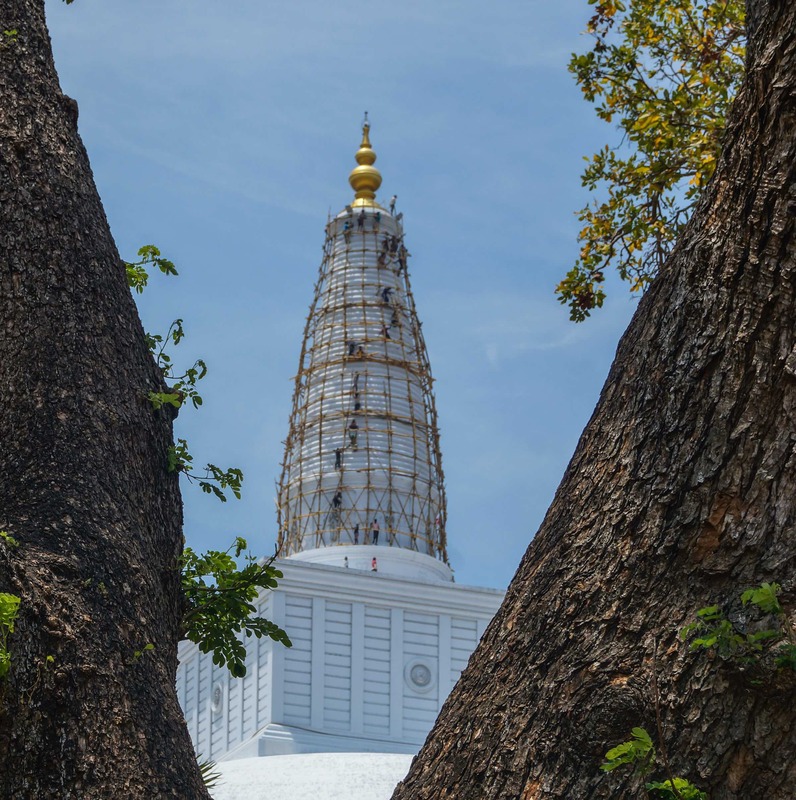 From afar I could already see the workers on the steeple of the dagoba, clinging to the bamboo ladders. 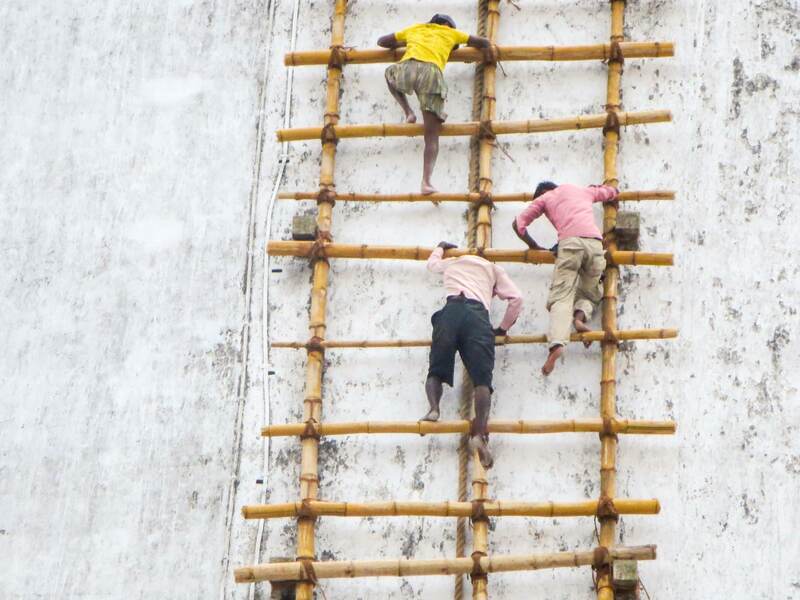 As I watched them scamper down the ladder – no safety harnesses, no shoes, no nothing to stop a fall – I held my breath. 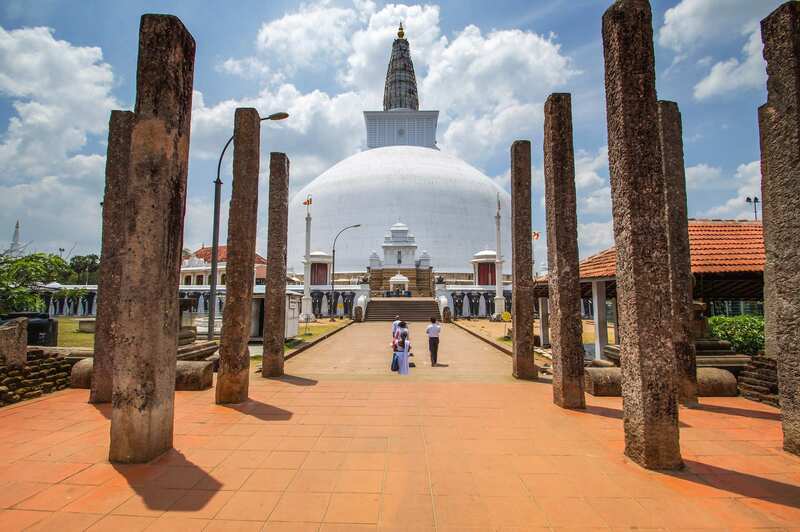 It brought to mind an image from the day before when I had come up to Anuradhapura from Colombo on the train. At one of our stops I glanced out the window to see a rail crew doing some construction; all the workers were wearing flip-flops as they did the shovelling and hauling away of some gravel. The only guy wearing shoes looked like the boss! 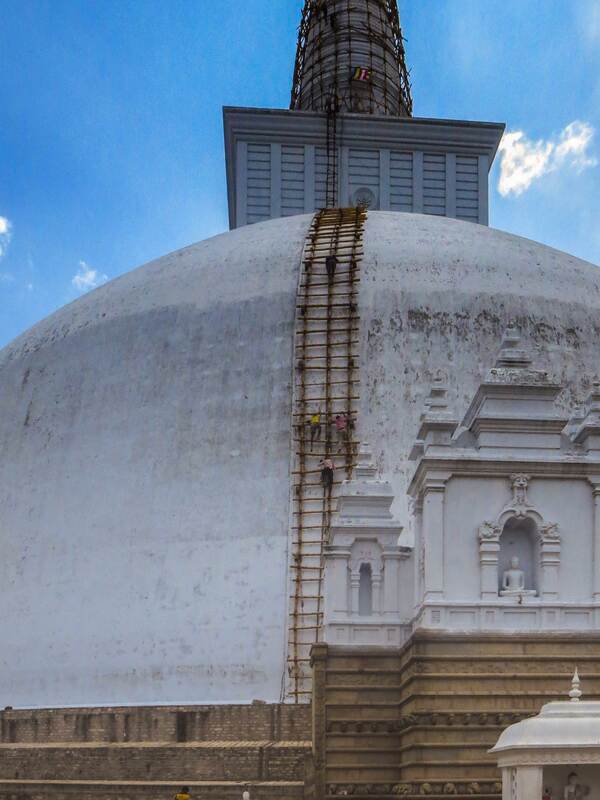 And now these guys on the stupa using the same techniques that their ancestors had two thousand years ago as they came down the bamboo ladder. 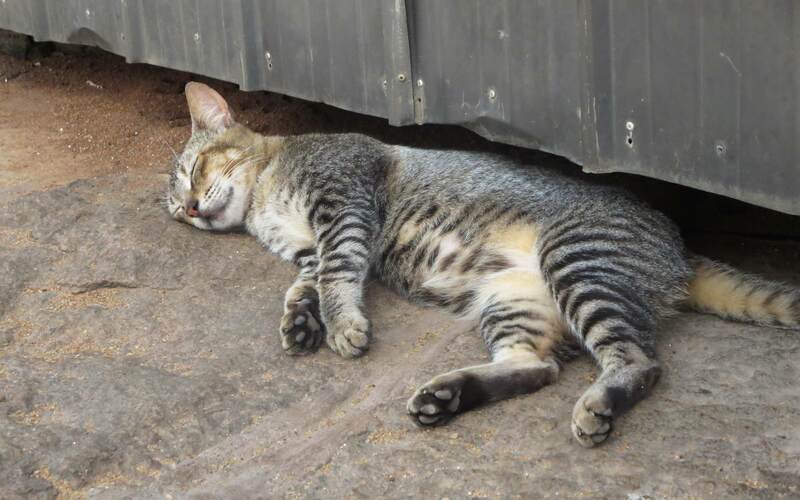 By this time I was ready to join the cat in the pic above for an early afternoon nap. But wait, there’s still a bit more! 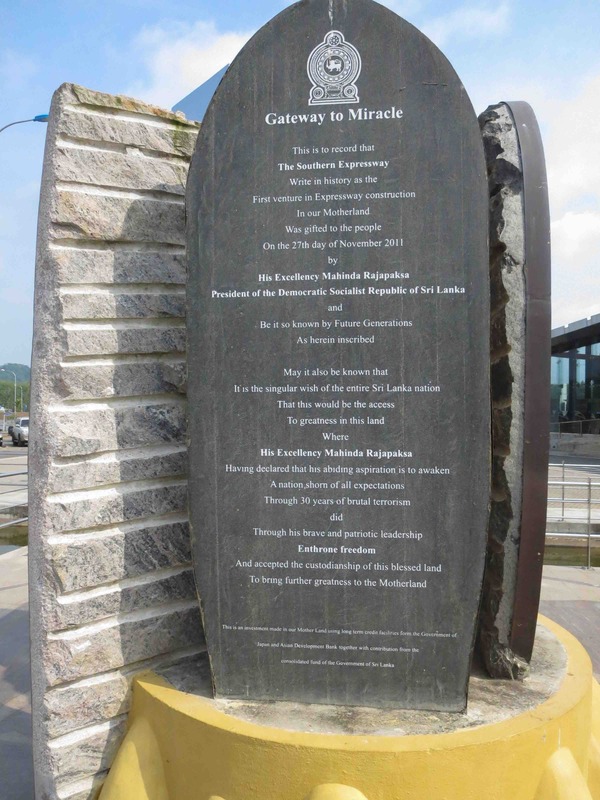 Off we went in Mahinda’s gas-powered chariot to the next “must see” site. 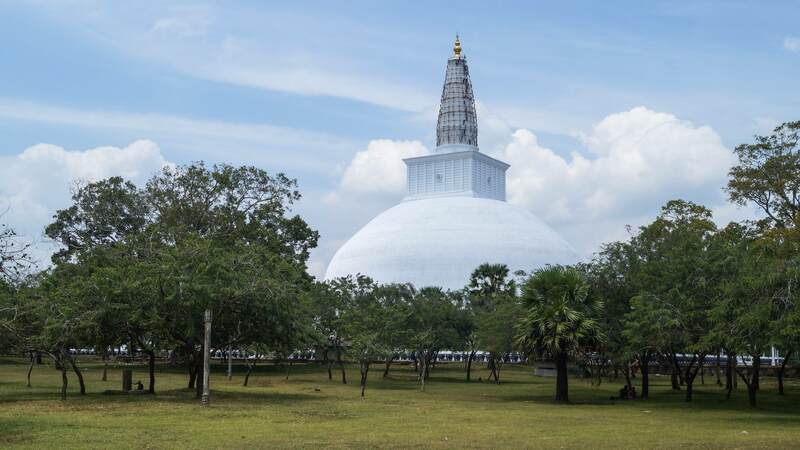 It would be our sixth stupa of the day – the Mirisavatiya Dagoba about a kilometre to the west of the Sri Maha Bodhi Complex I had been at an hour before. 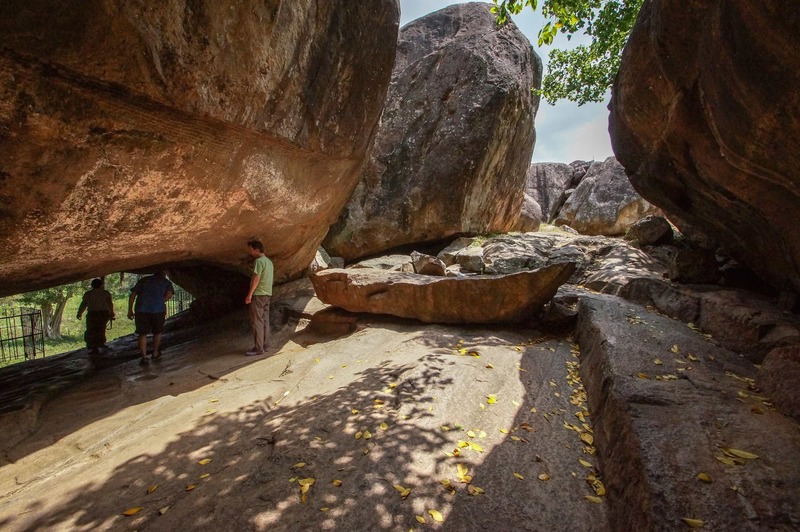 Leaving our sixth stupa of the day, we now headed south to the Vessagiriya Monastery area, where massive boulder formations provided cave-like shelter used by monks who once lived there. 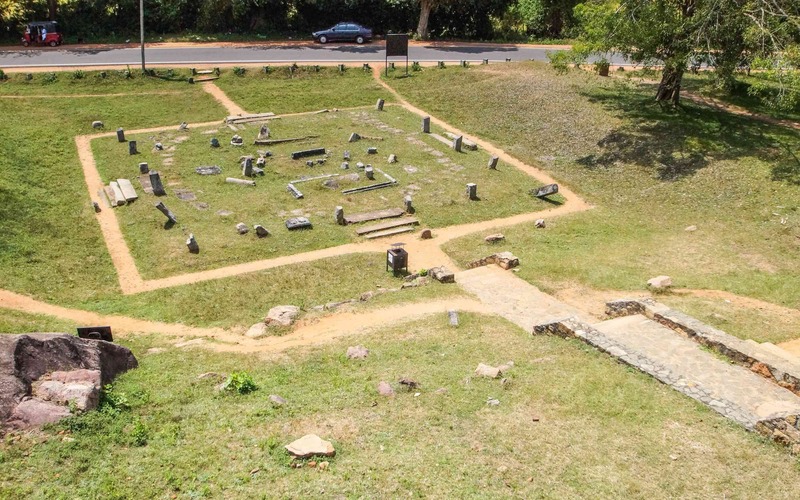 Also hinted at in the surrounding ruins were the other buildings associated with a monastery – an image house, a refectory, and a dormitory. 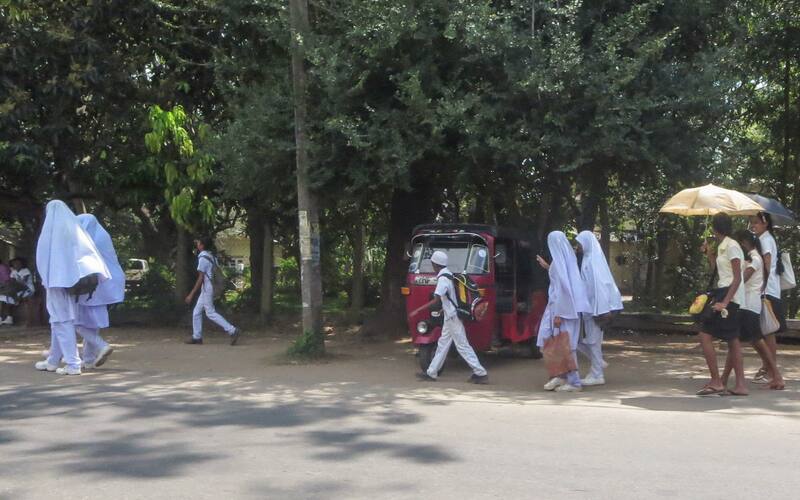 In the pic below you can see Mahinda’s red tuk-tuk in the shade on the top left corner of the image. 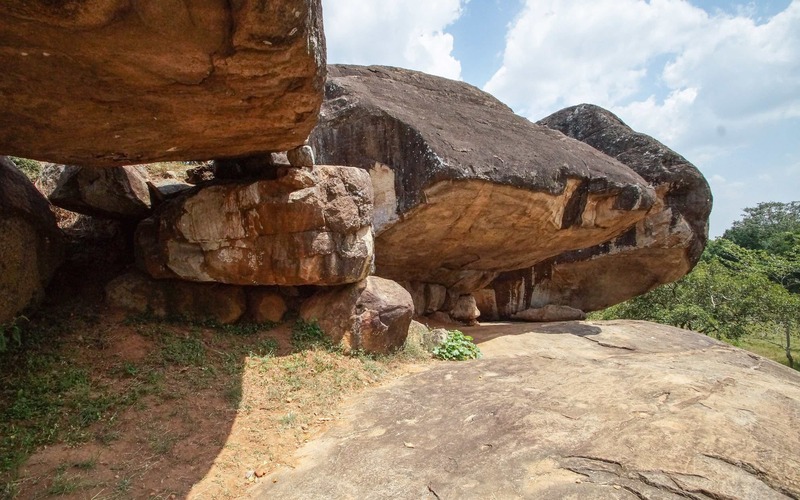 Meanwhile, it is 1:30 and I am being fried on top of the rock formations that overlook the site. 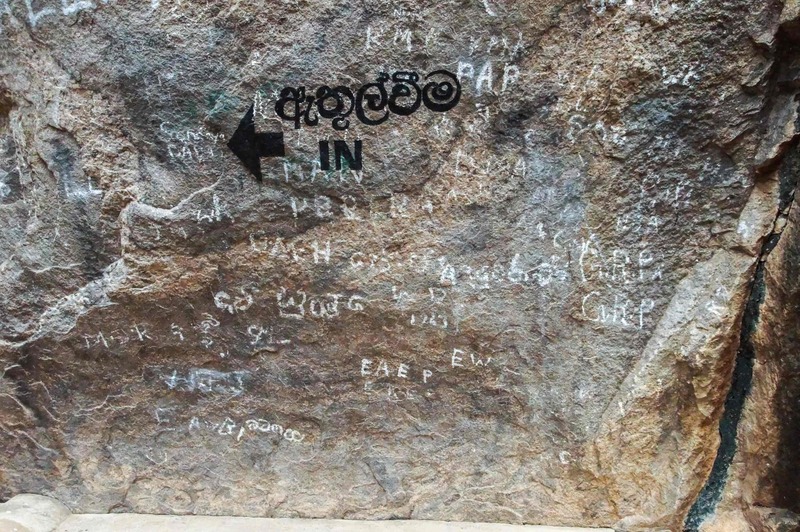 Below are a couple of rock carvings you see from the steps to the entrance of the rock temple. 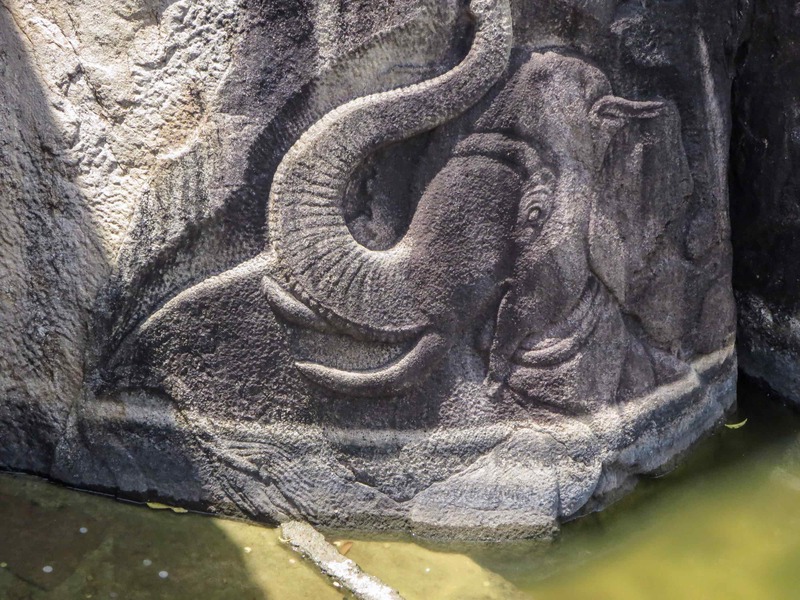 they are carved into the rock face above the pond. 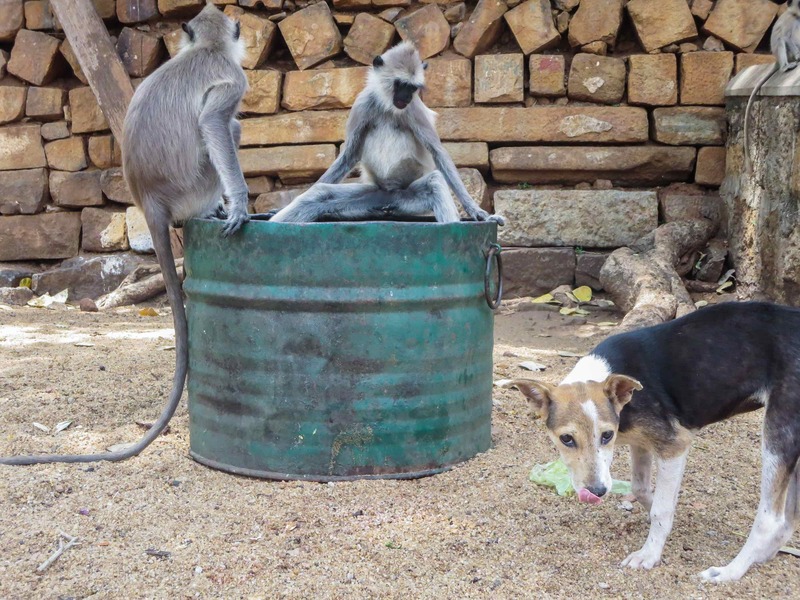 Both exhibit a certain playfulness and naturalness. 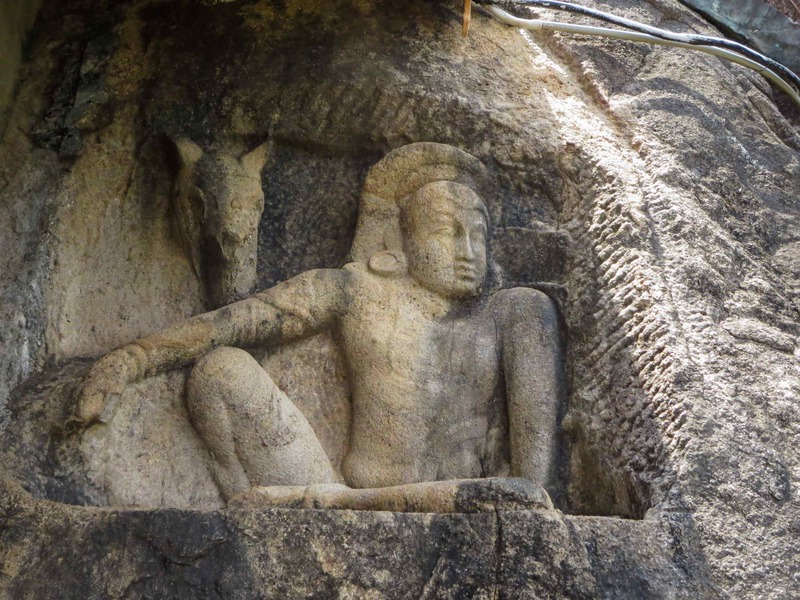 According to this source, their style shows “the influence of South Indian Pallava sculptural art of the seventh century”. We were not the only ones who were done. As we were heading back we passed groups of students heading home. 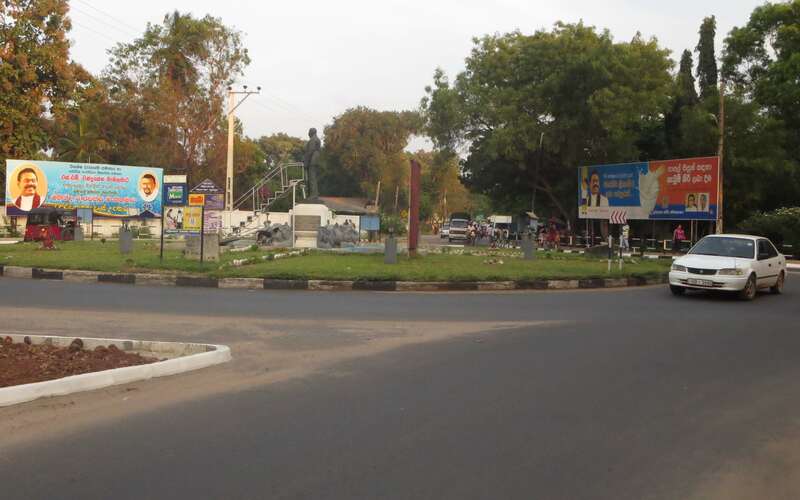 And each time we can to a major intersection there was yet another in-your-face billboard reminder of the existence of Sri Lanka’s “President-For-Life”. 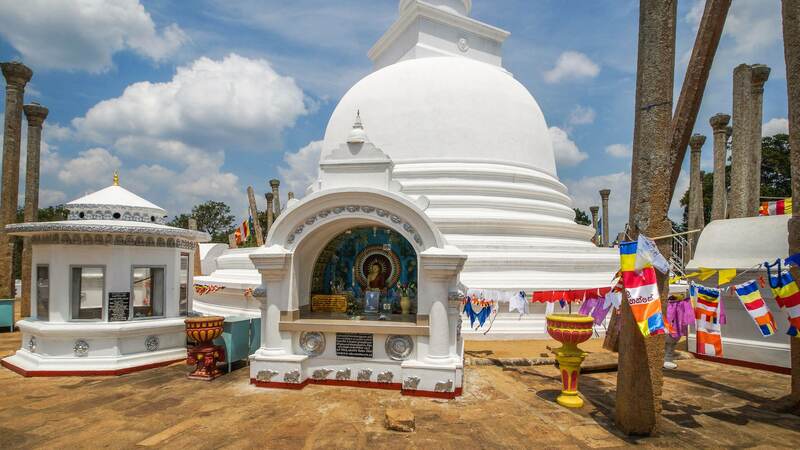 I am still waiting for news that, like the kings of old, he has commissioned the construction of a new stupa. While I was beat at the end of it, the day had been worth it. All told, I spend $50. 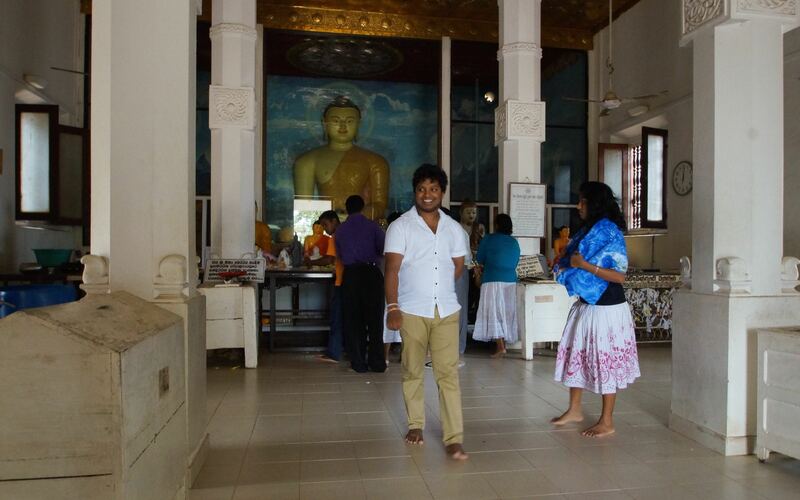 US for the ticket and for Mahinda’s services for the six hours he drove me from site to site. He had quoted me $20 US; with the $5. tip he ended up getting a bit more. it would have been nice if the day had been cheaper – or free! – but it isn’t so I just accepted the fact and went from there. 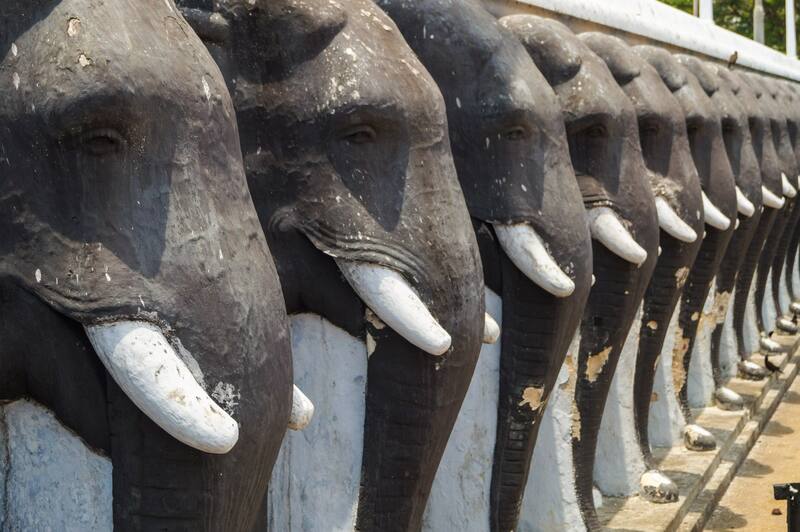 Now budget travellers will undoubtedly balk at the notion of spending $50. for the day’s sightseeing. They can walk if they want but given how I felt – and I was being driven around – i cannot imagine how one could see even a half of what I did by foot. 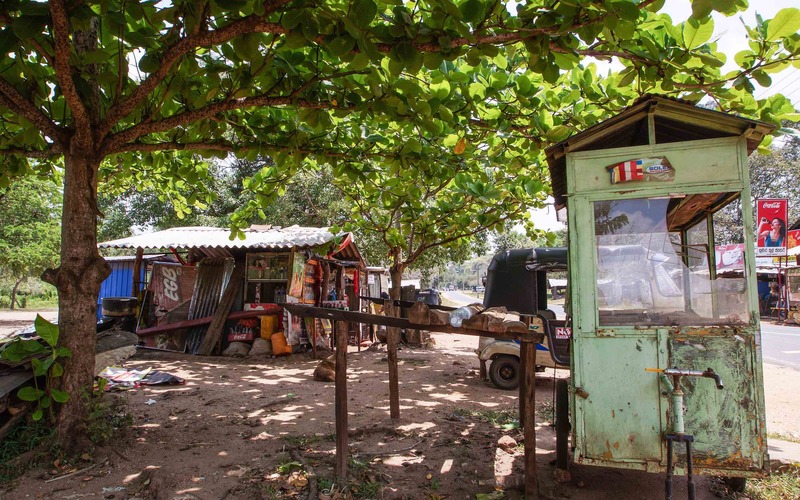 The bicycle is another option – bike rental may be in the $7. to $10. range. A bit more and you have a tuk-tuk! And, as I mentioned in Part One, you could try to see the site without paying. 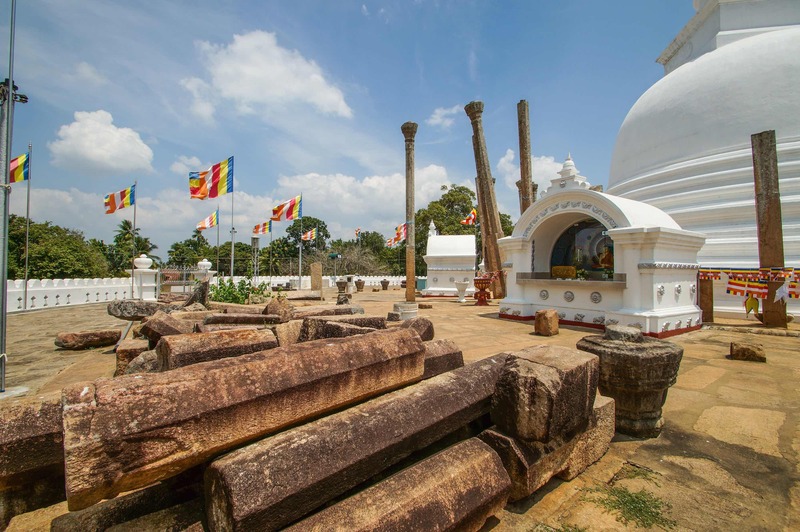 You would have to avoid certain obvious sites like the Sri Maha Bodhi and some of the stupas – and you would have to plead ignorance or be defiant or indignant way more than I would want to waste my energy on.